Students will learn different techniques on each obstacle and build their strength and balance! At the end of each class an obstacle course is created to test their skills and see how they have grown in Ninja Skills! We offer Level 1, Level 2, Level 3 and Pro Course Certification. Each level is about 3 months of classes and requires custom obstacles achieved at a certain time to advance to the next level. Its a great way to build confidence and see how they have improved! No matter what age, the Birthday Ninja will have a great time with their friends at Ninja Experience! Our trainers will make sure everyone from beginners to experts will have a challenging but super fun time! After a brief introduction of the obstacles and a review of safety procedures, the birthday gang will start their obstacle course adventure. 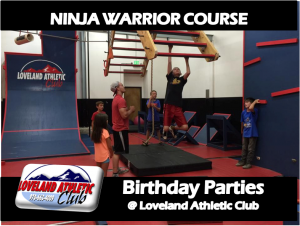 From individual to team obstacle races, this will be an experience the Birthday Ninja will never forget! A deposit of $100.00 for both birthday packages is required to reserve your date and time slot. Once reserved this deposit is Non-Refundable! Also your date and time slot can’t be changed!All participants much have a complete waiver filled out before they will be allowed on any obstacle. Parents or legal guardians must fill out a waiver for any participant under 18 years of age.Please make sure all participants are dressed appropriately. No open toed shoes allowed on obstacles.